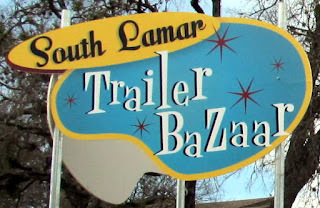 -- The South Lamar Trailer Bazaar sponsored a media tasting this week. It was a great way to check out all five of the trailers that sit on the lot just south of Red's Porch. 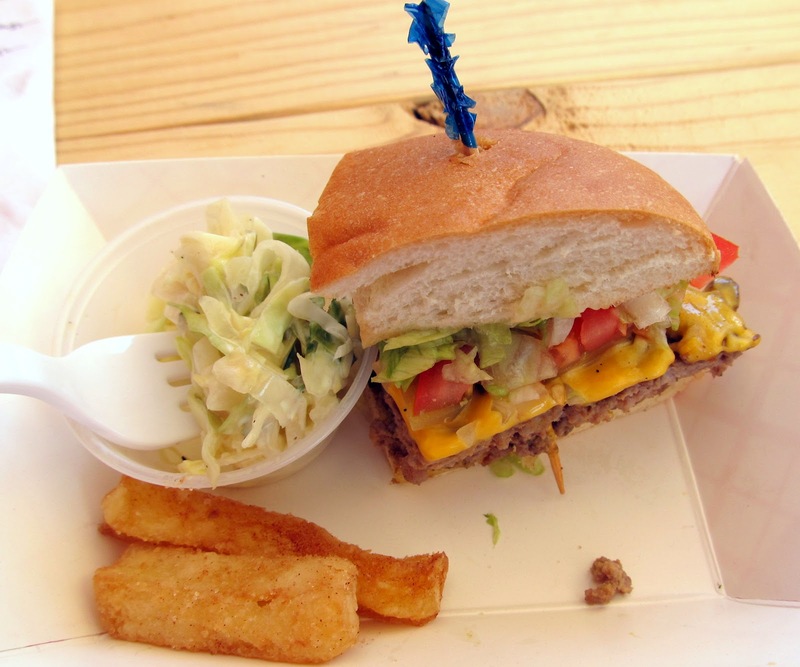 -- Collie's Burgers -- 1/2 pound hamburgers with very freshly ground meat! The apple fries were unique and really amazing! Nice burger variety on the menu. -- La Guera's Tacos -- inexpensive breakfast tacos, with a ton of possible combinations. We had two samples, a beef fajita meat with egg, and an al pastor with a red sauce. Their creamy green salsa was fresh and had a big kick to it! 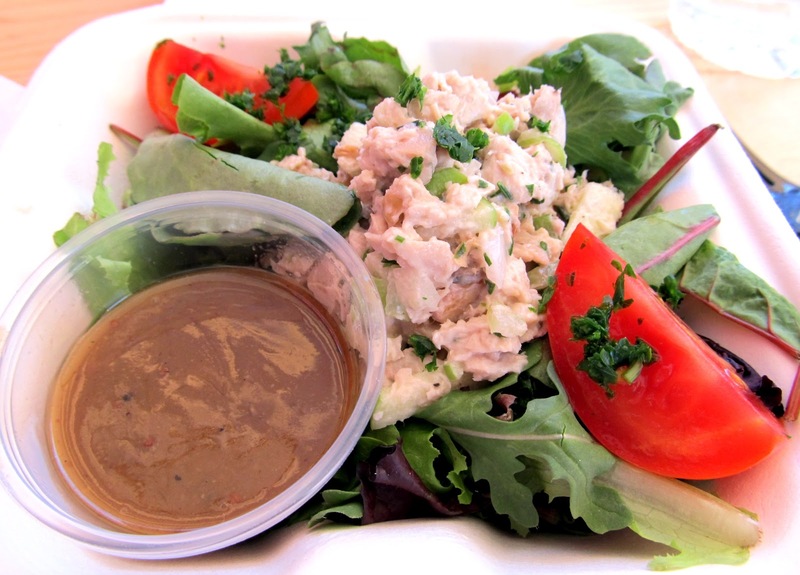 -- Boxcar Bistro -- a REALLY nice, almost light, chicken salad with tarragon, green apple, and walnuts. 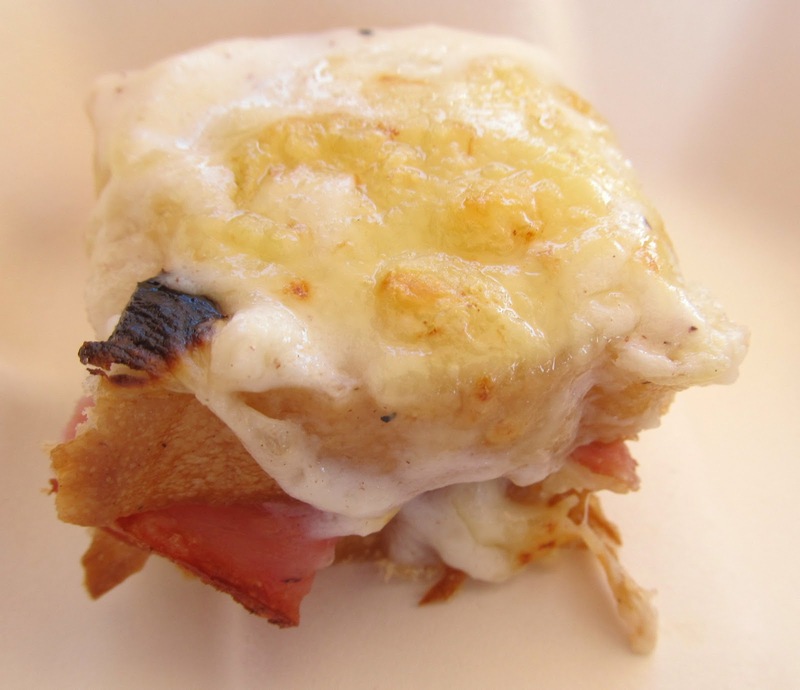 You can get it as a salad or sandwich. Also had a croque monsieur one of their signature dishes.....what's not to like about fancy grilled cheese? -- Tri Mai Thai made an incredible tom kha soup, one of the best things I tasted all night! 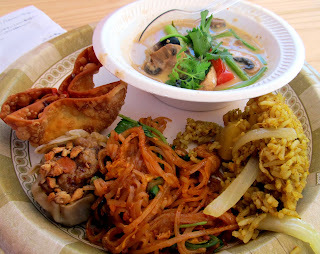 I have always been a fan of this coconut milk soup from Madam Mam's/Sap's, but the broth on this one was less coconut milk-y, but still tons of interesting flavors -- kaffir lime, galangal, straw mushrooms, chicken, shrimp....Also on the plate, from left to right are a crab rangoon and pork dumpling, pad thai noodles, and pineapple fried rice. To me it's sort of curious that a Thai trailer is making Chinese-style apps with the rangoon and dumpling, but the rangoon (made with real crab), particularly was delish. Also offering free beer! -- Honky Tonk Hot Dog uses nice all beef Vienna dogs, and they toast their buns! 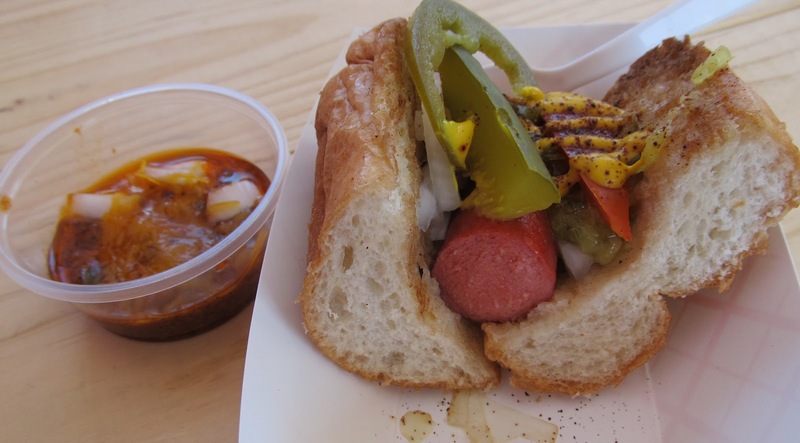 This was the Scott Dog, their take on a Chicago dog, and named after trailer owner and local musician Scott Angle. It's a fun looking menu with the various dogs named after honky tonk musicians. Scott and others will play music from time to time, which increases the South Austin vibe. So go check these fine trailers out! They've done a real nice job fixin' up the area, enclosing it with a fence, adding a play area for the kids, a small stage, covered seating, and most importantly, good food and real friendly people! -- Roll On Sushi Diner celebrates their first anniversary next week with drink specials and promos. On August 16, there will be happy hour specials all day, and for each item sold containing produce from the Grow Together Community Gardens, Roll On will donate $1 to the Gardens. August 17th has $1 drink specials and a portion of the proceeds goes to the Flatwater Foundation. On August 18th, more drink specials and proceeds will benefit the Health Alliance for Austin Musicians (HAAM). -- Olivia's next special dinner from Chef de Cuisine Andrew Francisco will be August 22, $110/person, with 11 courses and wine pairings. -- Con Olio will be hosting Tom Mueller who wrote Extra Virginity: The Sublime and Scandalous World of Olive Oil for a book signing on August 25th. Arboretum location, 11a - 1pm, Lavaca location 2:30 - 4:30 pm. -- Zhi Tea will celebrate their fifth anniversary in early September with some special classes and events. For more info, check them out here. -- Tickets for the Texas Craft Brewers Festival, to be held on October 6 at Fiesta Gardens, have gone on sale. -- Very excited to see that LuLu B's has (finally!) extended their hours! The Vietnamese trailer at Lamar and Oltorf is now open on Saturday evenings from 6 - 9 pm, and they appear to be offering some specials then as well. Hope this dinner thing will work out for them! -- And finally, congrats to both Lenoir and Elizabeth Street Cafe, two hot spots that both opened right around Christmas, have both been recognized by Bon Appetit magazine as top 50 new restaurants. Also excited to be going to a tasting for a possible new kabob trailer tonight! Stay tuned!! Are you going to the TX Craft Brewers Fest in Oct?? Anyplace that uses REAL crab in anything has my attention. That sounds like a promising stop for Thai, my fave! The soup was KILLER! and yeah, they said real blue crab and real Philly cream cheese in the rangoon!